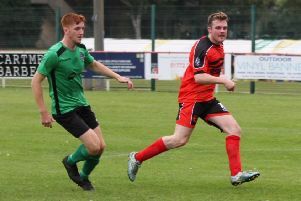 Garstang FC manager Lee Baker believes the club will see the benefit of playing one game per week for the next couple of months. A critic of the way the West Lancashire League fixtures have been compiled in the early part of the season, Baker is happier with his side’s schedule for the next few weeks. At present, they are only set to play once a week with games on Saturday until the end of November. They host Tempest United on Saturday, following on from the 1-0 win at Thornton Cleveleys last time out. His main argument has been the lack of Saturday fixtures and number of Wednesday matches instead, making it difficult for players with work commitments. “It’s helpful for us,” Baker acknowledged. “The lads need to know what they are doing because, at the end of the day, we are a Saturday team and we don’t need to play midweek games. “Lads work so that hasn’t helped us at all but, at least we now have Saturday, Saturday, Saturday, so we now know what we are doing. “We can plan ahead accordingly and the lads can let me know who is – or who isn’t available – rather than having a situation where we have a game thrown in on a Wednesday. “If you’re play in the Evo-Stik League or a competition like that then that’s when you’re playing two games a week. “The West Lancashire League has always been a Saturday fixture competition; that’s the way it is and that’s the way it should be.